The Memorial Candle Program has been designed to help offset the costs associated with the hosting this Tribute Website in perpetuity. Through the lighting of a memorial candle, your thoughtful gesture will be recorded in the Book of Memories and the proceeds will go directly towards helping ensure that the family and friends of Thomas Dyke can continue to memorialize, re-visit, interact with each other and enhance this tribute for future generations. 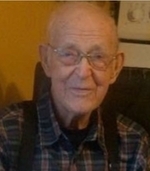 It is with great sadness that the family of the late Thomas Dyke announces his passing at his residence in Rencontre East on Tuesday, December 18, 2018, age 96 years. He leaves to mourn his loving family: sons, Bert (Dora), Brian (Natalie) and Chris (Tina) all at Rencontre East; daughters, Joyce (Peter) and Verna (Ken) all at Rencontre East; fourteen grandchildren and twenty three great grandchildren; brother, Alex Dyke at Bonavista; as well as a circle of other relatives and friends. Predeceased by his wife, Annie; brothers, Chesley and Robert; sisters, Rebecca, Naomi and Annie; parents, Sarah and Stewart Dyke. Funeral Service was held on Friday, December 21, 2018 at 1:00 pm from St. Stephen’s Anglican Church at Rencontre East with Rev. Tryphena Vallis officiating. Interment followed at the Anglican Cemetery, Rencontre East.